Now on its 10th year which was started by the American Photographer, Designer, and Author himself Scott Kelby, the Scott Kelby Worldwide Photo Walk has grown immensely in size and popularity since the inaugural walk in 2007. Last year, over 196 countries, and 4,416 cities with a total of approximately 25,000 photographers participated the 9th Scott Kelby Worldwide Photowalk exploring the corners of the world through photography and social community. In Cagayan de Oro-Northern Mindanao Leg, there were 58 hobbyists, students, and professionals who converged the annual event. This year, Cagayan de Oro located in the Northern part of Mindanao, Philippines will once again join the world's most anticipated global and social photography event, the 10th Scott Kelby Worldwide Photo Walk happening on October 07, 2017 together with thousands of cities all over the world. 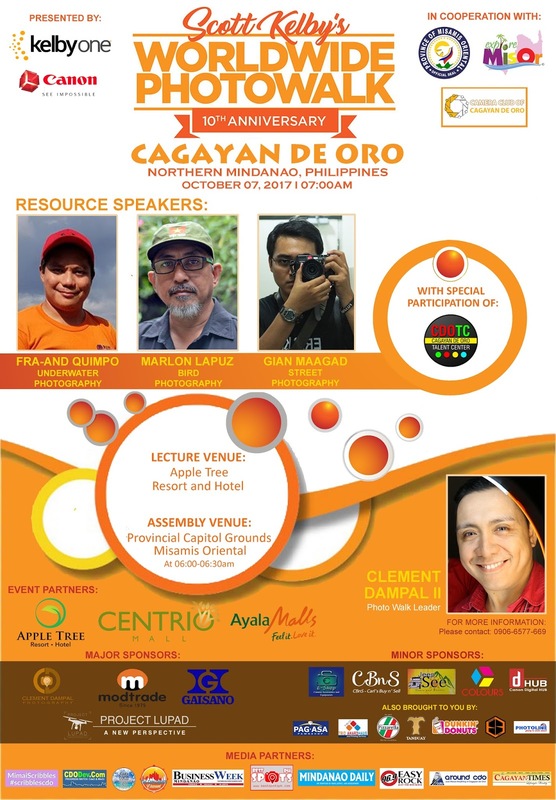 The Cagayan de Oro-Northern Mindanao Leg will be led by Clement Dampal II, a CDO-based Diversified Lensman, who also happened to be the Official Photo Walk Leader last 2015, and 2016 editions. Additionally, the Cagayan de Oro Northern Mindanao Leg is in cooperation with the Camera Club of Cagayan de Oro. In this Leg, the Photo Walk aims to promote Cagayan de Oro City and explore some parts of the Province of Misamis Oriental from heritage to tourism, the people's daily activity, infrastructure to growth, culture and the arts, wherein the viewers will have a bigger view of the endless possibilities of fun to experience. This will also give the participants an opportunity to actively engage in social events promoting the quality of life. Assembly time will be at the Provincial Capitol Grounds from 06:00 in the morning. The group then will be welcomed by the Governor himself Yevgeny “Bambi” Emano before the photowalk officially starts at 7 in the morning on the said date. By 3 in the afternoon, the photowalkers will be joining the exclusive Photography Lecture and Seminar at the Apple Tree Resort and Hotel (The Premier Resort Hotel in Metro Cagayan de Oro) conducted by renowned Photographers in the Region. Then, a special photo session will follow after the talks with the special participation of Cagayan de Oro Talent Center (CDOTC) by Mr Gabby Bacarro. - 28 Years as Photo-hobbyist, started 1989 using SLR-analog Nikon system. - Member: Oro Photographic Society (OPS) 1990-1998. - Founding Member: Kagayhaan Kamera Klub (K3) 2000-2005. - Org Member: Wild Bird Photographers of the Philippines, Inc. (WBPP) 2016- present. - Photo Walker Leader: 5th and 6th Scott Kelby Worldwide Photowalk 2012-2013. Aside of the Photowalk, registered participants of the Cagayan de Oro-Northern Mindanao Leg led by Mr Dampal, will automatically join the Local Photography competition which was introduced by himself last 2015, and have the chance to win exciting prizes from the sponsors. Additionally, each participants will have the opportunity to showcase there submitted photos to a photo exhibit at the Centrio Mall- Ayala, and Gaisano City Mall. In addition to the event, photo walkers will be able to upload their favorite picture to the popular Global Photo Walk contest for a chance to win a 1-year membership to www.kelbyone.com, a DSLR, gift cards, apps, camera bags and more. We will also name a Grand Prize winner and 10 finalists to be selected by Scott Kelby himself! Additionally, participants can connect socially before, during and after the event using the hashtag #WWPW2017 hash tag on Twitter, Facebook and Instagram. About Clement Dampal II: A Self-taught Diversified Lensman based in Cagayan de Oro, Northern Mindanao, Philippines who owns the travel site: www.bestspotsph.com. Founder of the Camera Club of Cagayan de Oro, and Co-founded the Mindanao Avian Photographic Society. Clement is a 3rd-time Photo Walk Leader of the Scott Kelby Worldwide Photo Walk and also the City Ambassador for the 24 Hour Project- A worldwide documentary project for 2 years consecutive. Clement was featured at Manila Bulletin's Picture Perfect Photographer of the Week, Finalist of Urbanlife's Photographer of the Year (2016), and ACADEO's (About Cagayan de Oro) Photographer of the Year (2016). In Cooperation with: Province of Misamis Oriental, Explore MisOr, Camera Club of Cagayan de Oro. Event partner: Apple Tree Resort and Hotel, Centrio Mall- Ayala. Major Sponsors: Project Lupad, Clement Dampal Photography, Modtrade, Gaisano City Mall. Minor Sponsors: Jeep See Tours and Events, Colours Digital Foto, Carl's Buy and Sell, E-Shop Camera Accessories and Equipment, Canon Digital Hub. Also brought to you by the following: Tanduay, Dunkin Donuts, Pizzarella CDO, Trio AwardHaus and Printing Services, Photoline, Pag-asa Pawnshop, Sovereign Skatepark. In partnership with these following media: Business Week Mindanao, Mindanao Daily News, Best Spots PH, Mimai Scribbles CDO, CDO Dev, Around CDO, Eats Good To Be in CDO, Easy Rock 96.9 FM Station, The Explorer's Channel, and Cagayan de Oro Times.